These mosaics aren’t about my sister, per se — more about clearing out her apartment. The first four pictures show how she lived. The second four, the clean up. As of this morning, it’s done. Keys handed over. Inspection performed. Cancellation of lease signed. There were a lot of people at the housing office. Bundled against the cold. Stacking and restacking all the papers they’d brought. Proof of this. Proof of that. I’m thinking the blue cross in my new quilt piece (more of a doodle than anything) might represent aid coming from unexpected places (a blue cross being a less recognizable symbol of aid than a Red Cross). The bird and flying insects represent freedom. The underlying thought is that it’s too bad my sister had to die for me to be free. It wasn’t the route I would have chosen. And my problems didn’t set it up that way. In other fiber news, I added an external pocket to my denim travel bag for my phone. Yeah! Also, the pennant I contributed to Mo‘s project, “I dream of a world where love is the answer” has flown home, along with tokens. In particular, I love the little white star. Thank you, Mo! And lastly, the woman who taught the Indigo workshop I attended in 2014 down in South Carolina, Donna Hardy, posted this on Instagram this week. I am shipping off a heavy weight cotton rectangle with a simple resist that came from Africa. It’s an honor to be part of this project, too. PS my eyes feel 90% better already! 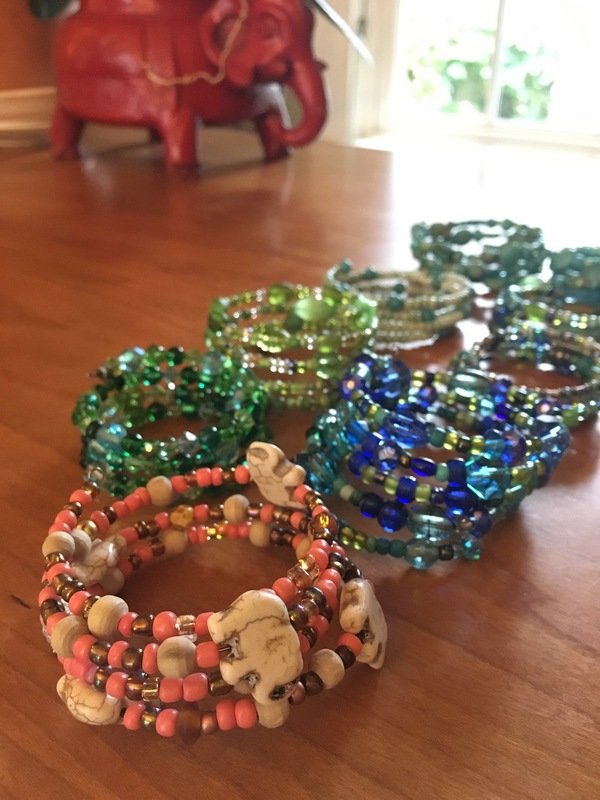 This entry was posted in Bags and purses and wraps, caregiving., collaborative art, Continuing, indigo, slavery and tagged death of a sibling, enslaved remains, gullah, Gullah society, indigo, it's crow time, reburial on April 9, 2019 by deemallon. Some thing’s getting done. Other things getting fucked up (by you know who — don’t ask me about aprons right now). Will make (an unexpected) run to Salem today in order to take my sister to the North Shore housing office. She’ll be signing the lease for subsidized housing this afternoon. Hooray! Now if only Son #2 would get a job — something, anything — if only to stave off K and me having to ask, “What is our limit here?” I don’t know the answer to that, but I do know that many families would’ve considered it reached and then some. It is very cold today. Very. As in, bitter. But, Finn and I walked around the lake with a friend and she graciously shared stuff about the child of hers that has needed extra this and extra that. Her words were the first gift of the week. The second is that K has agreed to come home early so that I don’t have to abbreviate the visit with my sister in order to accommodate the dog. Off to fix an apron! 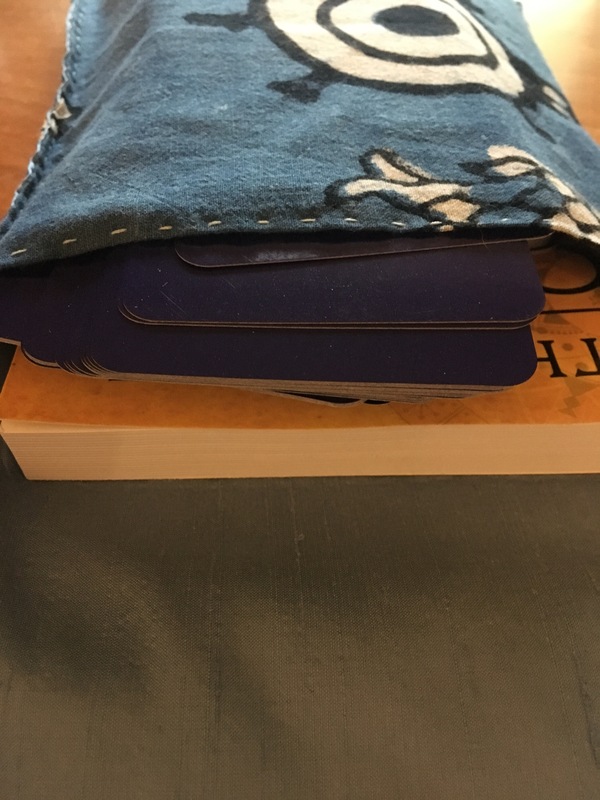 This entry was posted in Bags and purses and wraps, caregiving., finishing, House quilts and tagged bitter cold, Craft show preparation, dependency on March 19, 2018 by deemallon. If there is something to sew on backwards, I’ll sew it on backwards. 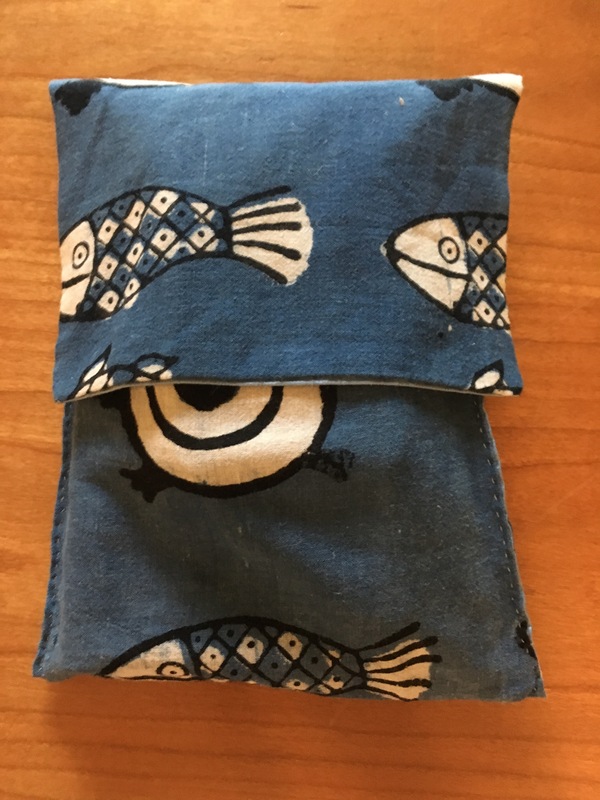 For this simple project, I lined one of the many woven rectangles lying around the studio to serve as an apron pocket and then stitched the waistband on the wrong side of the opening. I thought I was so clever to simultaneously stitch the pocket to the apron and stitch the pocket turn-opening, thus making one line of machine stitching unnecessary. Dismayed and generally averse to ripping out, I sewed the damn pocket shut and called it a day. So much for feeling clever! After a pause (the all important pause), I realized It wouldn’t be so bad to fix since I’d only have to rip out the length of the waistband. So I did. Opened up the pocket. 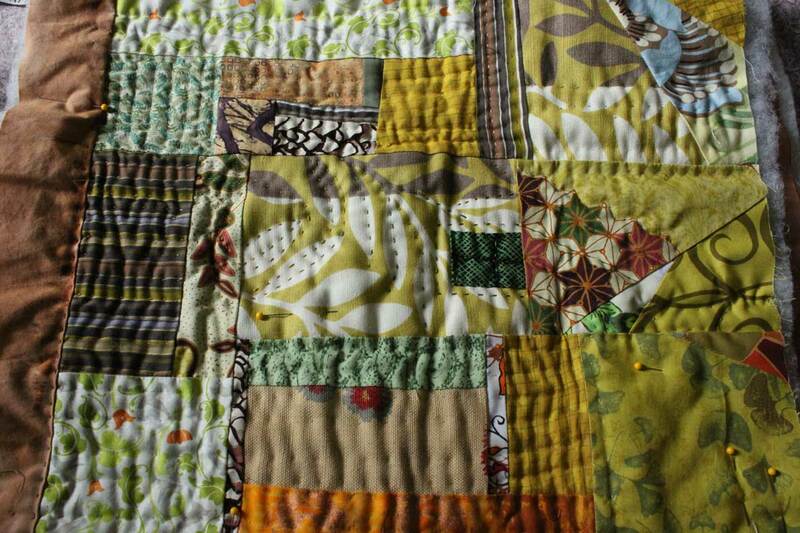 Added some hand quilting. For waistband Round Two, I used a contrasting geometric print instead of the same seer sucker as the apron. I like it a LOT better. The same yellow print lines the pocket. To my mind, there is only one essential feature of an apron — it must have ties long enough to wrap around the waist and tie in front. That way, I can tuck the essential hand towel into the ties. A dish towel over-the-shoulder is a distant second for convenience. Prefer 100% cotton, of course. Pockets and bibs are features I don’t much mind but don’t seem to need, either. 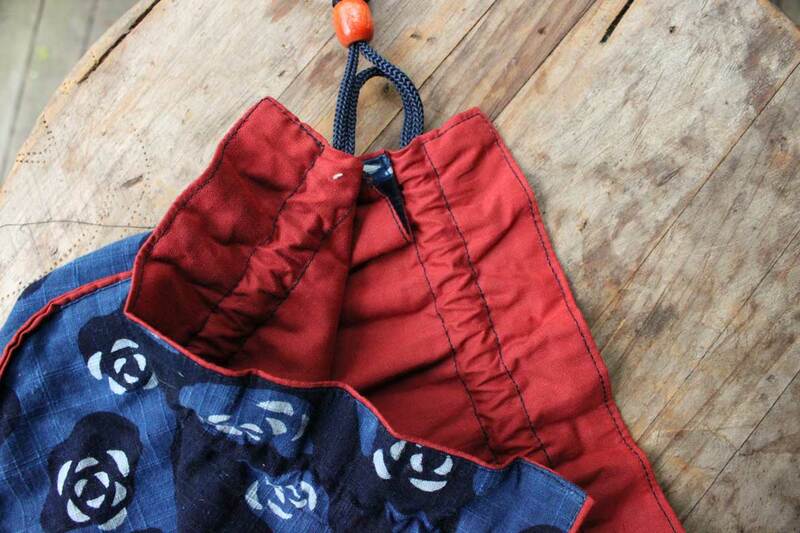 Maybe the recipient of this apron will find good use for a roomy centered pocket. If not, it looks nice! In case you’re wondering, I am also baking cookies, mailing packages, walking the dog, watching election results, emailing commissioners at the FCC, helping to plot my younger son’s next steps, and WRITING. PS. Ninety inches (for this waist) affords enough length to tie the apron strings in front. This entry was posted in Bags and purses and wraps, domesticity, Home & Garden, politics and tagged aprons, fixing mistakes, sewing on December 13, 2017 by deemallon. Sometimes a lot gets done even though it seems like nothing gets done. This weekend was like that. It felt wattless, but maybe wasn’t. A new charm is underway. The finished sigil is for protection but given how disoriented I feel (blame it on the July temperatures in the middle of October!) — perhaps I ought to make one for clarity? Finn and I just walked in air so hot and muggy that I might actually put the AC on (again! we broke down & got it going on Saturday). Meanwhile, D texted me while I was rounding the corner of Maplewood to say: it’s snowing hard in Boulder. A weekend that saw me puttering, cleaning, sorting stuff (STUFF!) 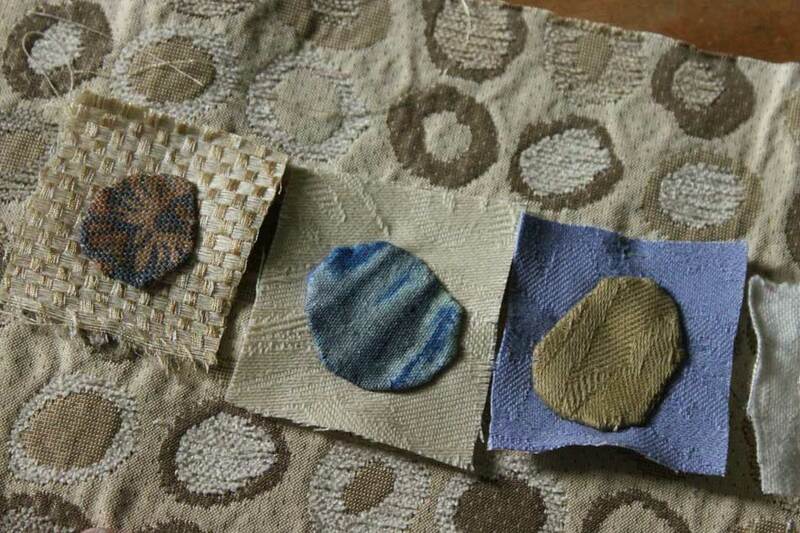 down in the studio and elsewhere, also saw a few things being completed, born, or dusted off. Since Tina Zaffiro asked about pouches, I pressed the two I came across in my cleaning to share. Also: partnered up cloth downstairs for some new ones. Think: Christmas. I like to get going before Thanksgiving on my Christmas list, that way shopping and making feel fun instead of oppressive. 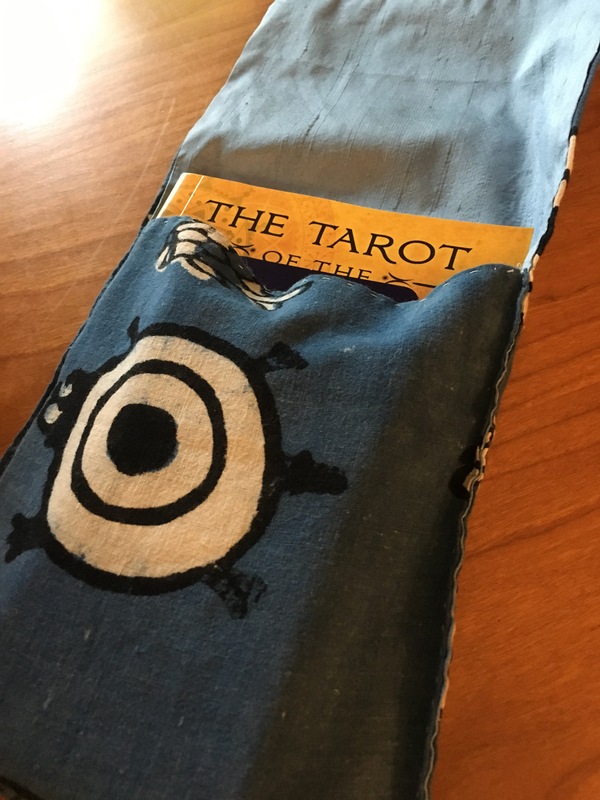 The fish pouch is ideal for my Orisha Tarot deck because it easily houses the book as well as the cards. Also, the lining is silk which is reputed to have the power to filter out negativity. That’s it! I should be wearing all silk, all the time! And now I’m just avoiding writing, so bye. Have a great start to your week! 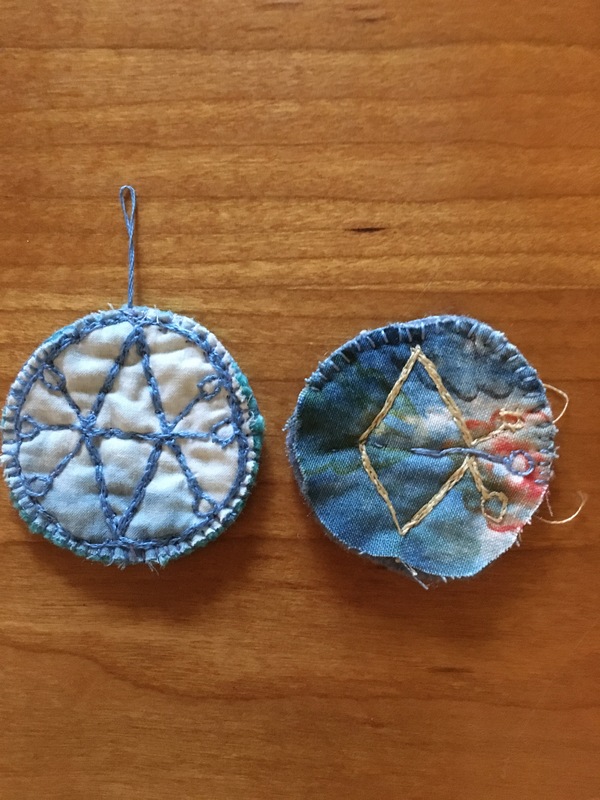 This entry was posted in Bags and purses and wraps, In the Studio, totems and tagged sewing, Tarot on October 9, 2017 by deemallon. This little heart-embellished door can be the passageway into July. Why not? It was hard to cut the hankie that offered up these red hearts, but I’m glad I did. I for one, am planning to create some pockets of joy this month – so what better doorway for the season? 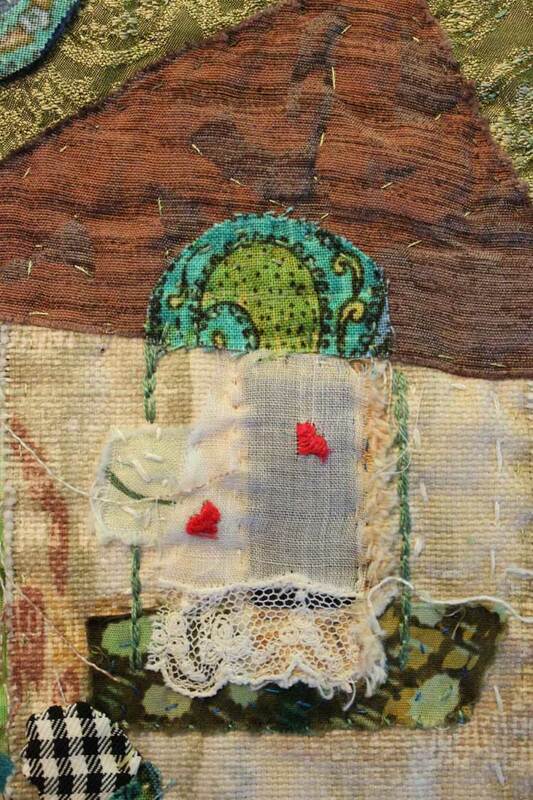 This piece is small – about six inches square – and to my eye, has a decided “Quilting Arts” feeling to it. It’s the checked flowers, I think. Today, I’ll add tabs and find a stick to hang it from, and call it done. Moon needs a few more stitches. The Tshirt quilt project has been revised to – duvet cover. 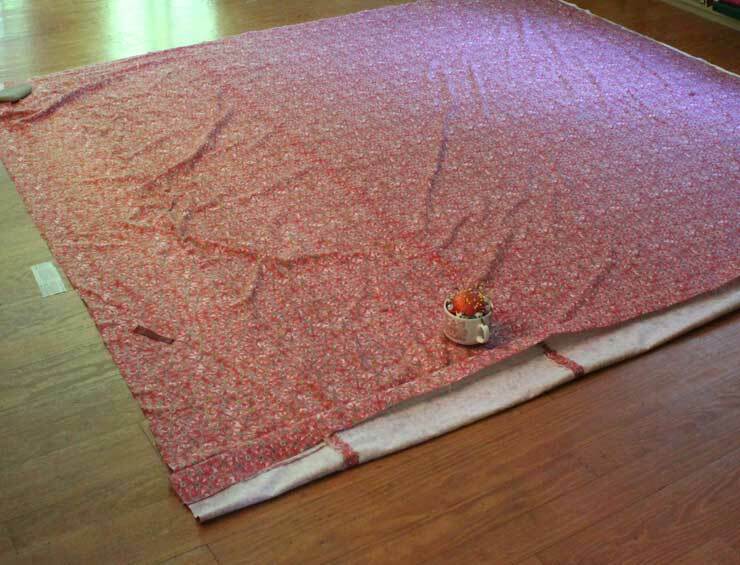 It would be very difficult for me to quilt a blanket that is 91 inches square with my current set up. 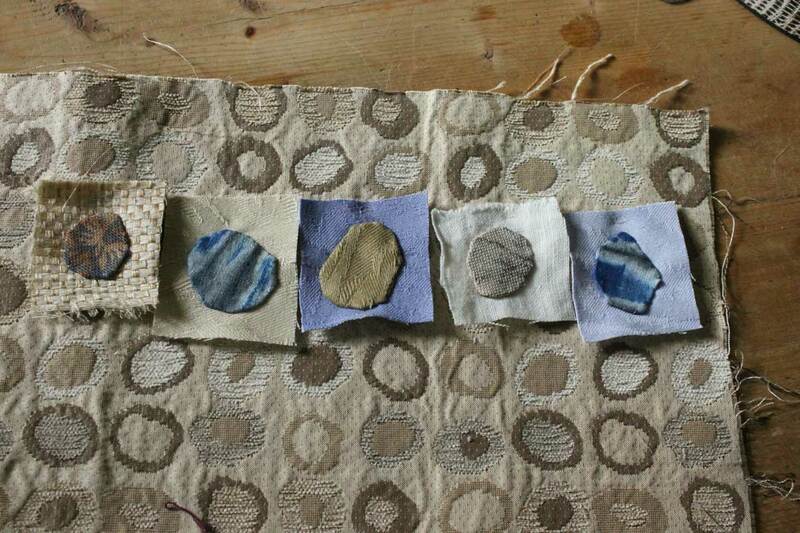 Yesterday, I hand-sewed the buttonholes. Today – I will tack down the edge you see here, connect the quilt top and this red print, and sew on the buttons. The end is in sight! 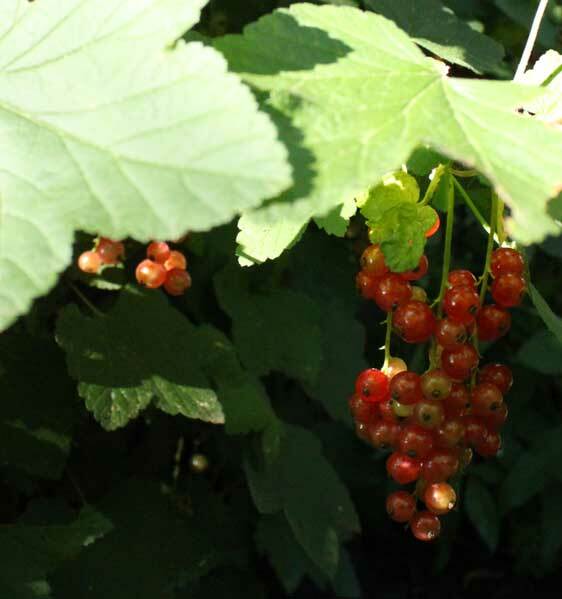 Our sole surviving currant bush (too near the neighbor’s driveway and their handyman’s plow-path!) is rife with fruit. I will make a tart for K and me – because the boys are away and because they wouldn’t like it if they were here! And speaking of the boys, here is a relic from boyhood. 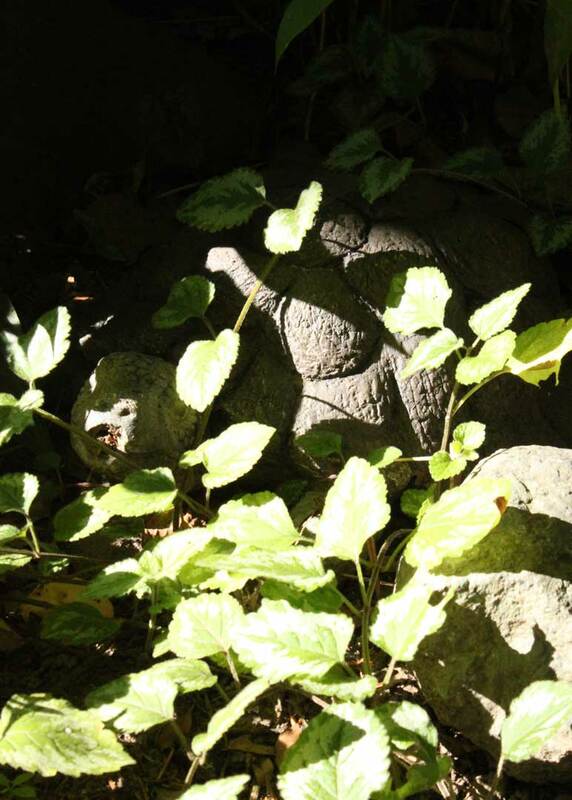 This is the “Peepee Turtle”. In their younger days, this was the place for all outdoor urination. Contained the activity, somewhat. This poor turtle has not been pee peed on in quite a few years (that I know of, anyway). A reliable summertime joy? 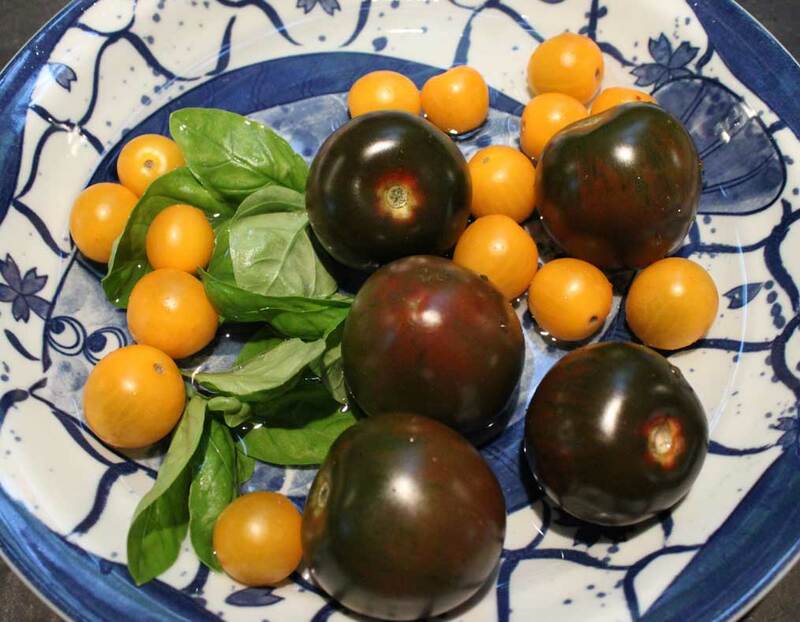 Tomatoes and basil. These were mixed with halved mozzarella balls for a little bit of heaven in a bowl. Lastly, as a teaser, while on the Vineyard last week, or two weeks ago?, we went to The Dumptique… a little shack filled with clothes and books, associated with the dump, where everything is free for the taking. 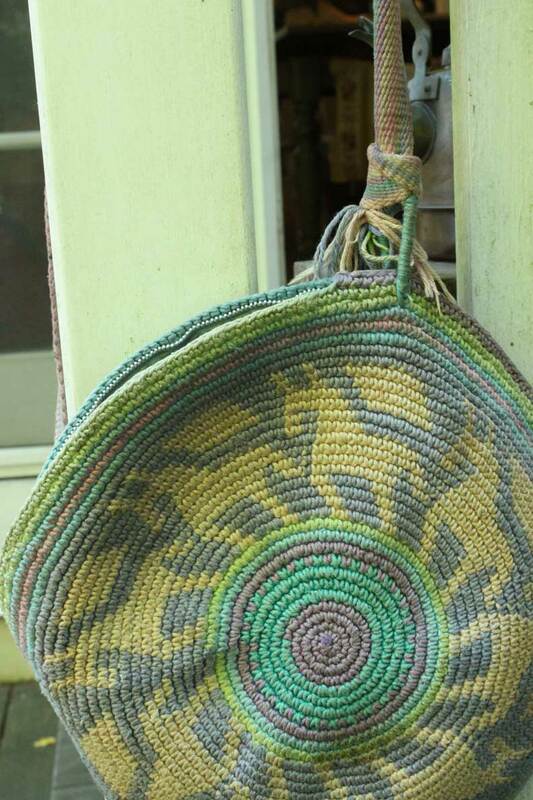 I found some exciting garments – more on that another time – and this lovely, if a little beat up, crocheted purse. I love that it is round and features horses, trotting endlessly in a circle. It needs a good washing, and then — I’m not sure what. 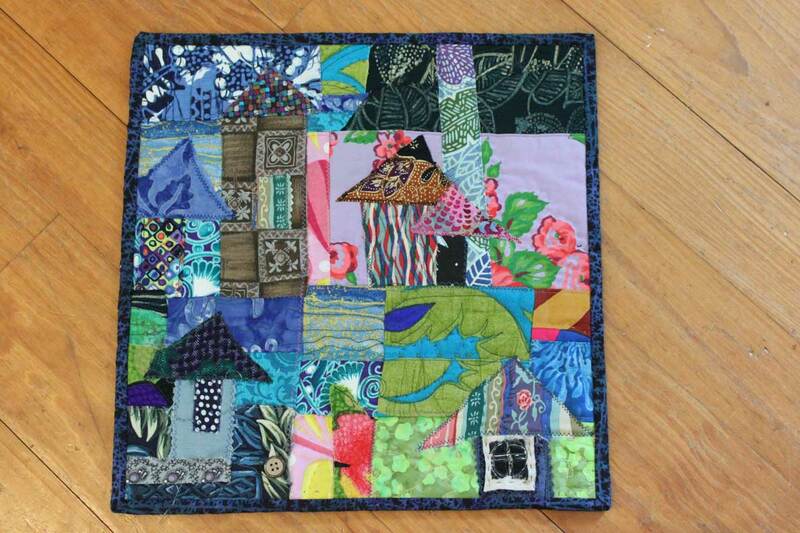 This entry was posted in Bags and purses and wraps, finishing, House quilts on July 3, 2012 by deemallon. Items in progress on the coffee table. This fragment from the larger Middle Passage series is nearly done. 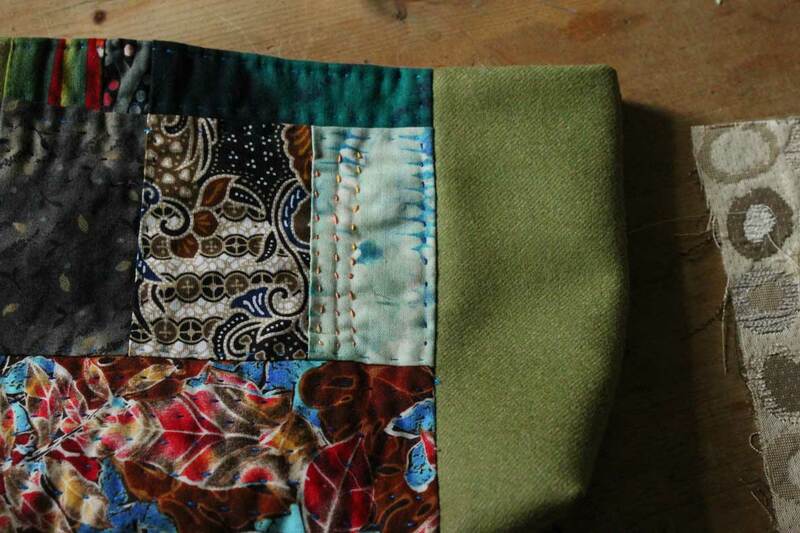 A little bag in progress… not sure how I’ll construct straps yet. 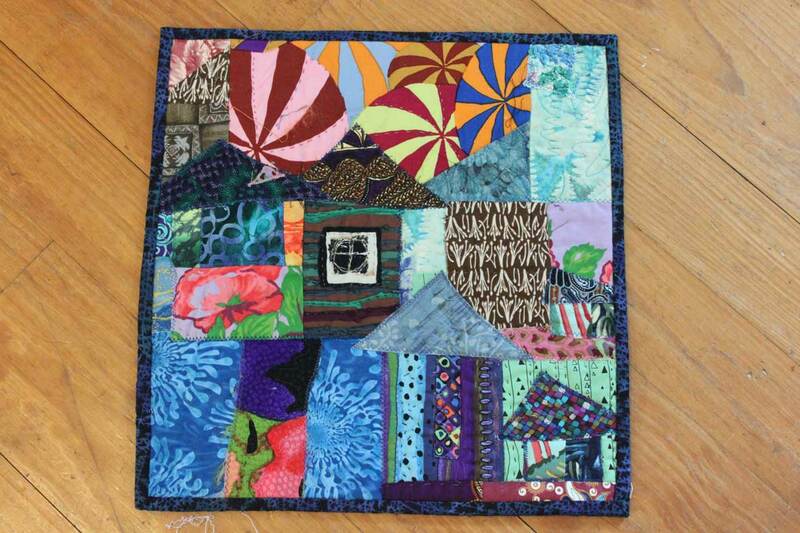 I shipped these 2×2″ squares to Jude Hill on Thursday as part of her “Magic Feather” project. It’s a real lesson in scale, because at four by four instead of two by two, this little shape is decidedly more moon-like than stone-like. 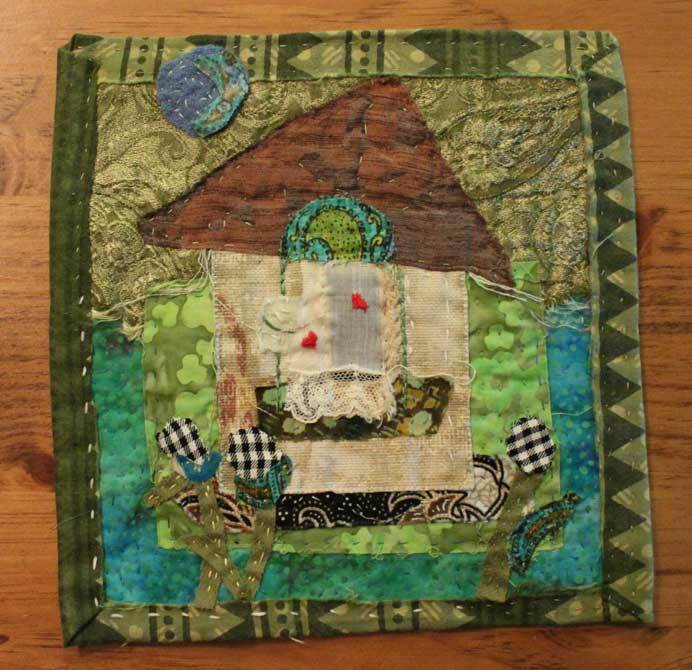 This entry was posted in Bags and purses and wraps, Middle Passage and tagged "dee mallon", "magic feather", 'middle passage', applique, patchwork, purse, quilt, quilting on May 26, 2012 by deemallon. 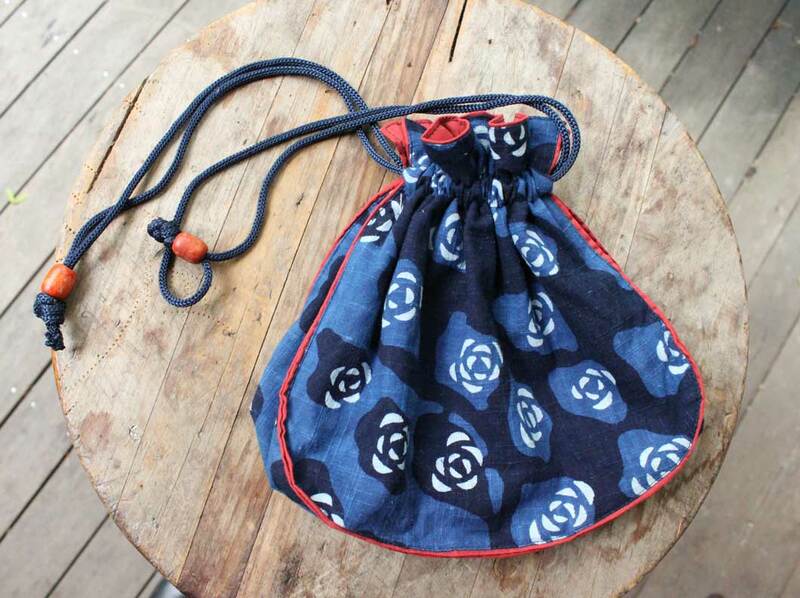 This simple and beautiful bag was the inspiration for the two-quilt-messenger bag that I made last week (below). It is constructed from three pieces – the front, the back, and a single side piece. 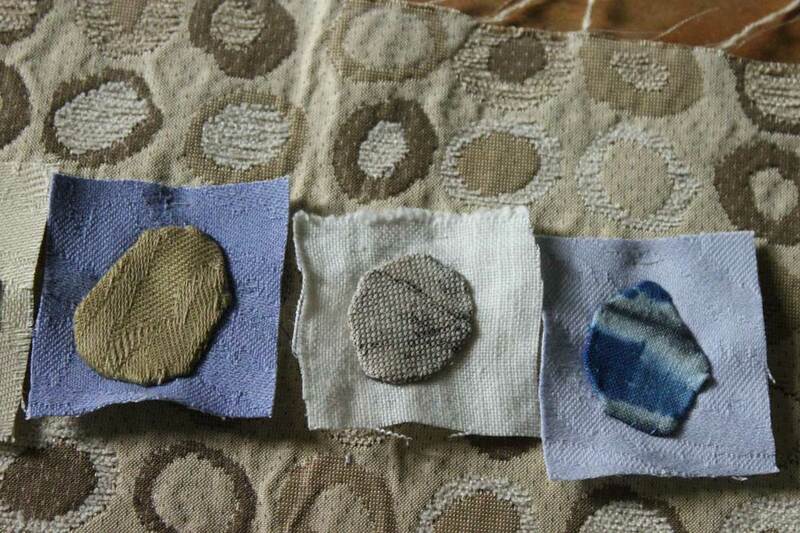 Each component has a blue face with a red backing. The side panel does not come all the way up to the uppermost edges, in order to leave room for a casing, which houses the blue cord pull-ties. 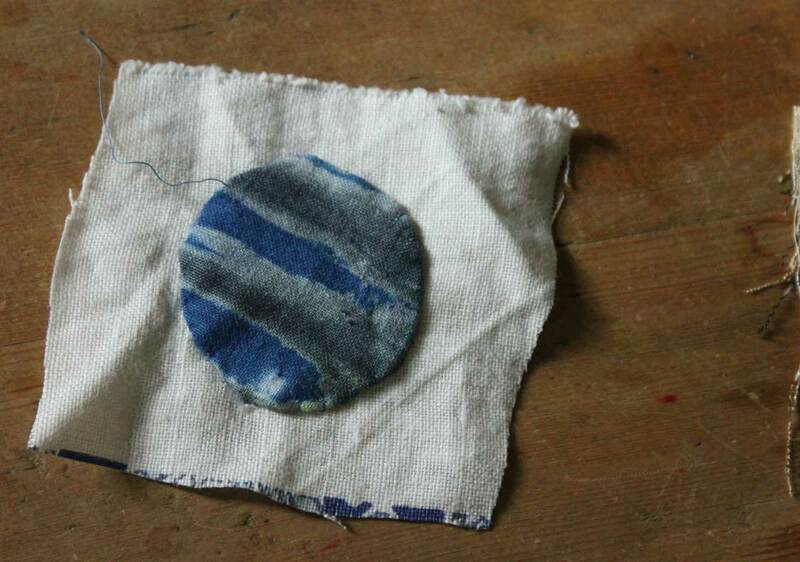 The casing is just a gap between the red lining and the blue front, with two lines of stitching to define. Because you seam the finished components wrong sides together, there is no need to leave an opening in the final construction phase in order to reverse, the way many bag patterns require. By using the red contrasting fabric for the inside of each of the three pieces, and making no attempt to hide any seams, a beautiful line of color is created – very much like piping. The ties are long. Each of the two loops exit on opposite sides, so that when you pull the ties, the loop that is inside the casing opposite, tugs closed. It’s a simple and elegant design, through and through. 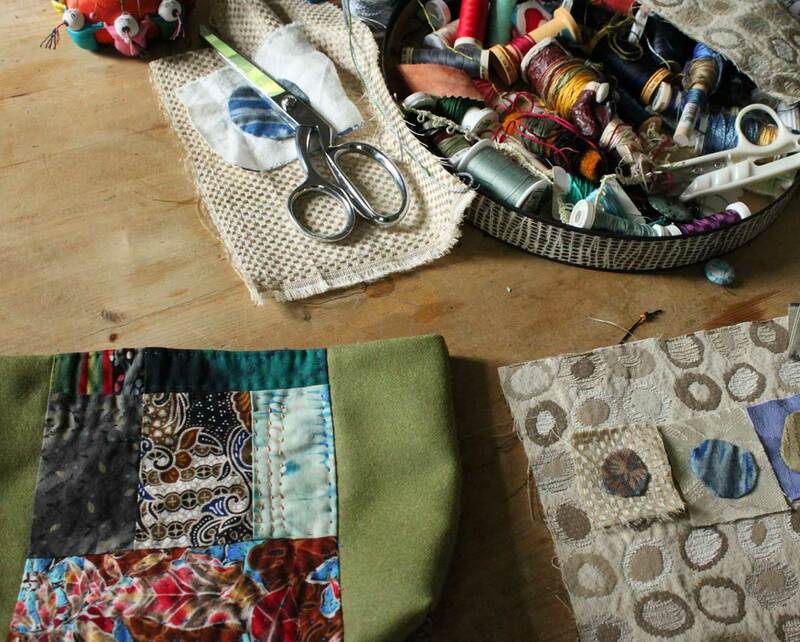 I thought of this bag as I was pulling the next two quilts out of a drawer during my three weeks of purse sewing. 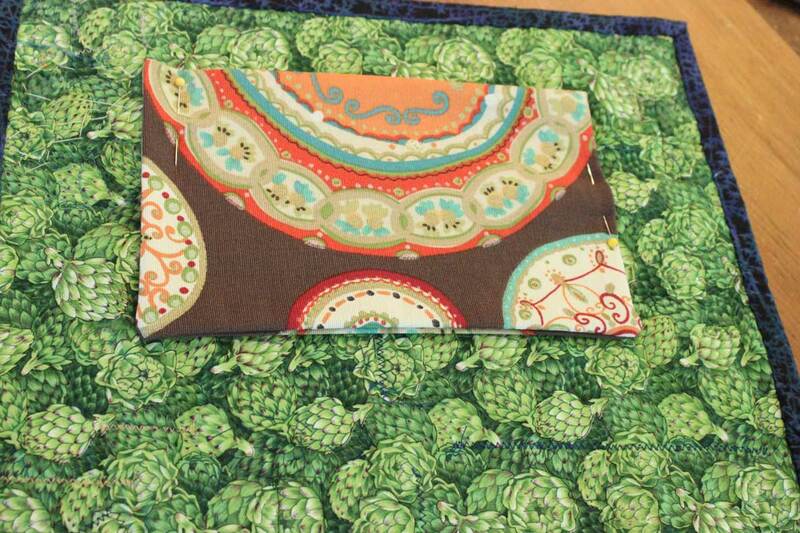 About 14 inches square, these two panels were a good size for a messenger bag, or what I’m calling a messenger bag. A true messenger bag would have a fold-over flap. I realized that once I removed the dowel sleeves, I had two of the three pieces of the model Japanese bag. I constructed a blue strap with finished edges that was long enough to run around three sides of the bag and then up and over the shoulder (14 inches x 3 plus about 35 inches). I included enough length to make a loop on one end that the other end would tie into, so as to make the strap adjustable. 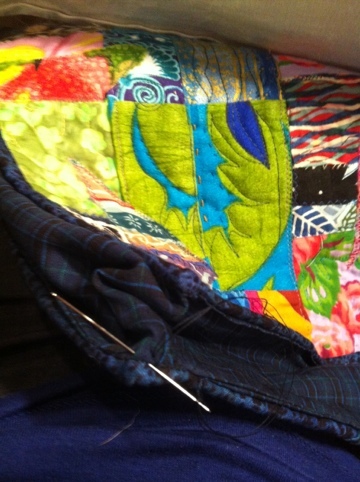 I also added a good-sized lined pocket on the wrong side of one of the quilts. P.S. 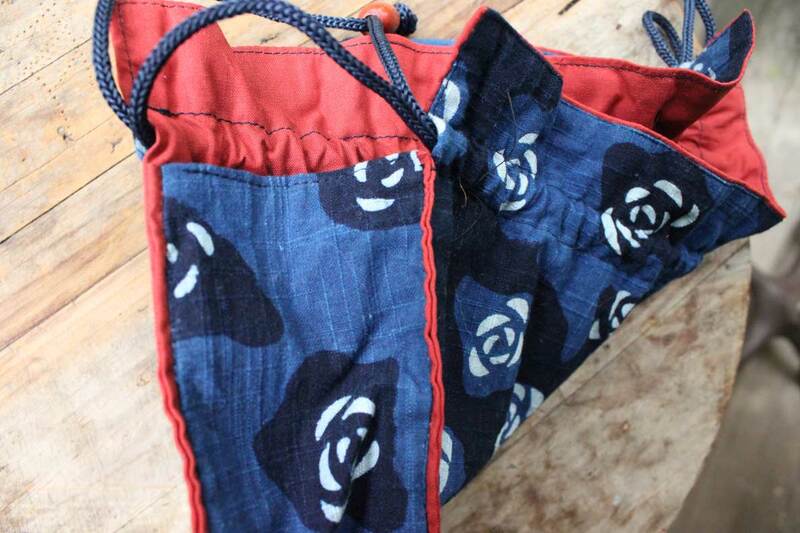 While sewing mine together, I realized that the curved edges were critical to the design of the indigo bag. I had to stop my side panel seams just short of each corner, leaving four holes that I then hand sewed. I didn’t really want to cut the 14″ x 14″ quilted panel – doing so would have wrecked the bound edge and posed a different construction problem. 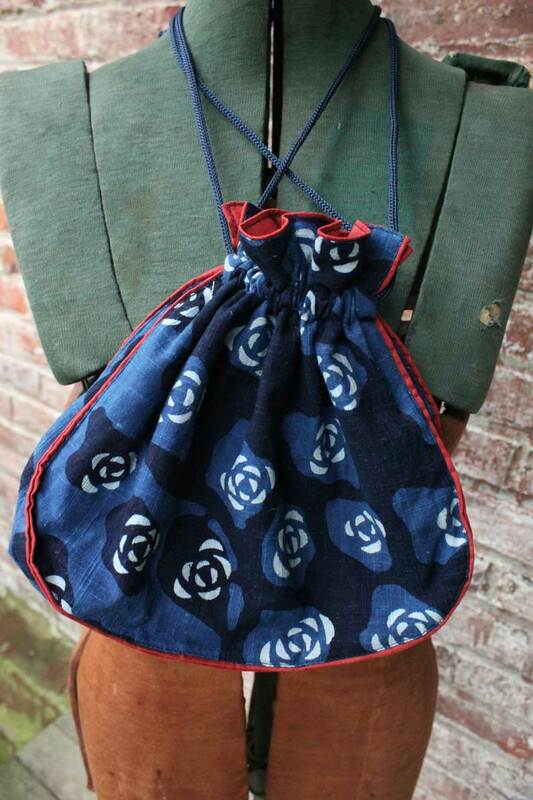 * I bought this bag from a couple who made a wide variety of useful objects out of beautiful Japanese indigo cloth many years ago at a huge holiday craft fair held at Boston’s Seaport World Trade Center. I have no name to share with you, I’m afraid!! 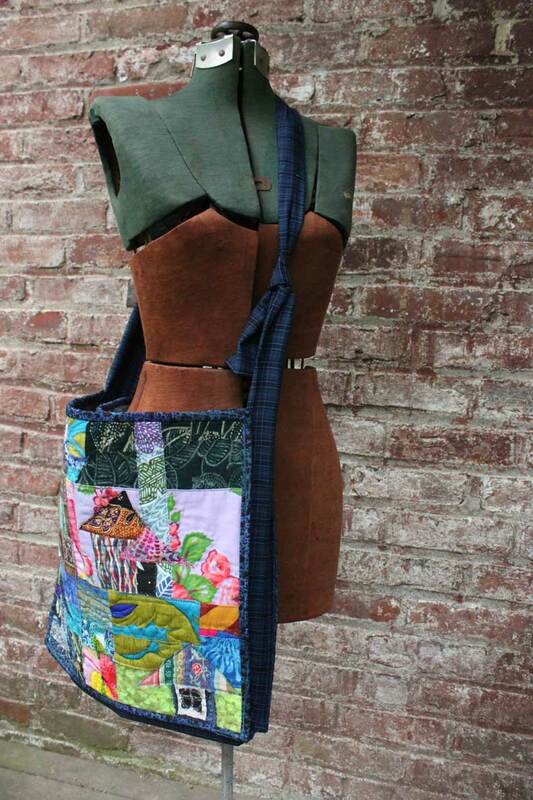 This entry was posted in Bags and purses and wraps, Boro and tagged "dee mallon", "messenger bag", cloth, cloth company, indigo, purse, quilt, repurposing, sewing on May 22, 2012 by deemallon.